Moms Are Now Primary Breadwinners In 40 Percent Of Homes : The Two-Way The share of households where a mother is the sole or primary source of income is at a record high. A new Pew Research Center survey of public opinion finds that many Americans remain worried about that trend. 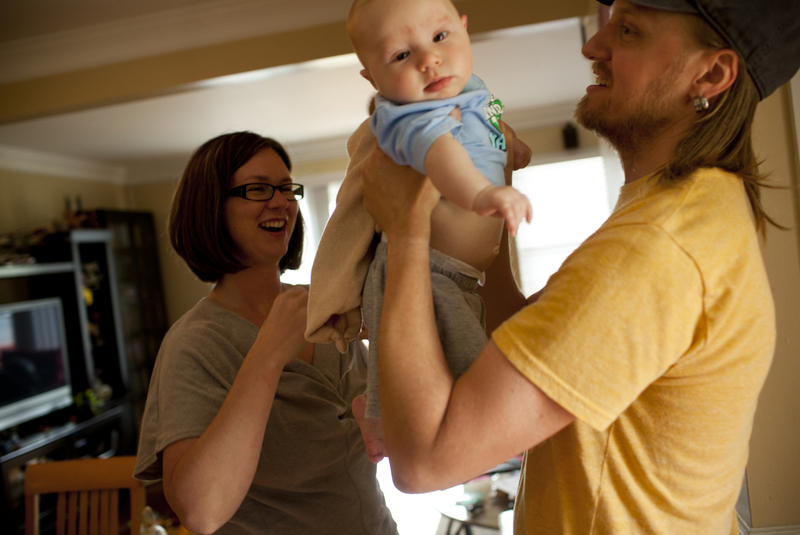 Dawn Heisey-Grove of Alexandria, Va., hands off son Zane to father Jonathan Heisey-Grove after a midday feeding. The couple were both working full time when Jonathan lost his job as a graphic designer two years ago. She's a public health analyst. He's now a stay-at-home dad. "A record 40 percent of all households with children under the age of 18 include mothers who are either the sole or primary source of income for the family," the Pew Research Center reported Wednesday as it released data that certainly won't surprise many Americans but will underscore some dramatic shifts over recent decades. Citing data from the Census Bureau as its source, Pew notes how much has changed in just a few generations: In 1960, so-called breadwinner moms were the sole or primary sources of income in just 11 percent of U.S. families with children. — "Breadwinner moms are made up of two very different groups: 5.1 million (37 percent) are married mothers who have a higher income than their husbands, and 8.6 million (63 percent) are single mothers." -- "The growth of both groups of mothers is tied to women's increasing presence in the workplace. Women make up almost of half (47 percent) of the U.S. labor force today, and the employment rate of married mothers with children has increased from 37 percent in 1968 to 65 percent in 2011." -- "About three-quarters of adults (74 percent) say the increasing number of women working for pay has made it harder for parents to raise children, and half say that it has made marriages harder to succeed. At the same time, two-thirds say it has made it easier for families to live comfortably." -- "About half (51 percent) of survey respondents say that children are better off if a mother is home and doesn't hold a job, while just 8% say the same about a father." -- "On the topic of single mothers, most Americans (64 percent) say that this growing trend is a 'big problem;' however, the share who feel this way is down from 71 percent in 2007." The April 25-28 national telephone survey of 1,003 adults has a margin of error of +/- 3.5 percentage points on each result. -- Stay-At-Home Dads, Breadwinner Moms And Making It All Work. -- NPR's "Changing Lives Of Women" special series.